There exists a nightlife destination in Providence that the average man dare not enter past 10pm. Not out of fear of criminals, but fear of the Providence hipster. Stereotyped as young, pretentious, naïve and all around annoying, they receive their name from the often-overlooked reality that they are in fact, “hip.” Ironic neck-tattoos aside, they know what’s cool. Especially where to drink. But the average crowd generally avoids these watering holes either A. because they aren’t hip enough to know they exist, or B. to avoid Prov’s trendy creatures of the night. My team of “cool-but-not-that-cool” compadres and I took to the streets of the West End of Providence to find out what draws people in/scares people away for the Broadway Bar Crawl. We started with a standard trendy-locale — a vegetarian bar (not that other bars put meat in their booze; they serve veg meals during regular hours). By day, The Grange draws in crowds of localvores, foodies, vegetarians and those on a never-ending quest for organic. But by night, it’s a neighborhood hangout. If there’s one thing those keen to the scene do right, it’s cocktails. Imbibe trends of the moment deliver high-end spirits like bourbons, gins and dark rums and fuse them with house-made bitters, fresh herbs and hand-squeezed fruit juices to put a twist on classics. When on Broadway, do as the hipsters do. The result? 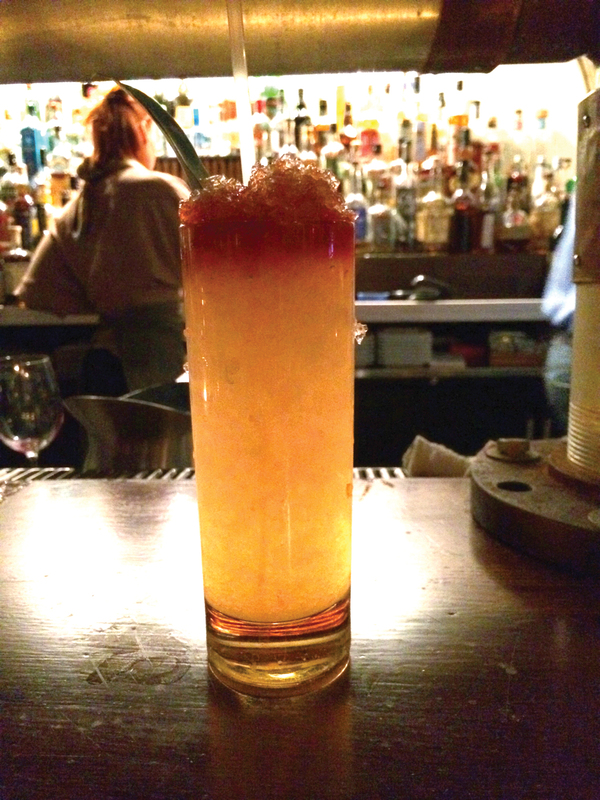 A “Mai-Tai Foster”—Smith and Cross, Orgeat and banana, Ango, and lime. The craft drink sparked a thirst for a “ruby red martini,” moving the crawl down the street and around a back alley to The Avery. Surrounded by some of Providence’s few remaining cobblestone streets, The Avery is a marriage of swank and charm. The leather chairs and dim, warm lighting gives the vibe of a bar where a man in a suit whispers sweet nothings in your ear as he sips a dirty martini. Until you take a closer look at the crowd and realize it’s a pack of rowdy 20- and 30-somethings in jeans sipping tall boys, nodding along to the Pixies song bumping through the speakers. No matter how elegant, pricey and gastro-chic a menu is, there will always be a dude in a flannel and a beanie pounding $3 Gansetts. He’s not only accepted, but encouraged around these parts. Or you can find people in slacks and a blazer, passionately discussing politics. Or you can show up in an old sweatshirt with high-end drink in your hand and speculate over why someone’s wearing a backless shirt and a knit scarf. It’s basically a mixed bag of drunk people in a dark, elegant room with a fantastic soundtrack. The night concluded at the edge of the West End in a slightly brighter, far less elegant room with an equally fantastic soundtrack. Once reserved for crack smokers and aggressive bikers, The Scurvy Dog has come a long way, now described as, “Punk Rock Cheers.” It’s, “The place where everyone knows your name.” But they’re most likely yelling your name from across the room, six shots of whiskey deep. This is where the coolest kids of the ‘80s and young adults alike come together to drink, listen to punk rock music, and to drink. Here’s looking at you, Broadway.